"Spain has turned the corner". With this stark statement the IMF opened it's annual Article IV consultation report for 2014. Naturally the statement rankled, with this author among others, because at first sight it seems to be saying something which on closer reading of the report you find it isn't. At best it's misleading, possibly from a PR point of view intentionally so, but then Article IV reports are supposed to be more sober, measured assessments. One Spanish journalist summed up the surprise many felt in the following tweet. What I suppose the authors of the report were trying to convey was the feeling that an important turning point had been passed along the long winding road out of the mess that was generated in Spain in the first seven years of the Euro's existence. Personally I can't help feeling the expression would have been none the less prosaic and much more complete had they added the line from a well know Jimmy Cliff song - yet there are still "many rivers left to cross". Equally, "not through the rapids yet" comes to mind. The danger of putting things in the way the IMF Spain team just did is that you open yourself up to the accusation of being complacent, even self-congratulatory, and almost lacking in the necessary even handedness since it could be seen as lending a helping hand to a struggling government which is about to ramp up its 2015 election campaign. Indeed more than one journalist took it this way. There's a danger here, one of institutional credibility, should the economy once more succumb and fall back into a triple dip. Indeed the downside risks detailed in the report offer plenty of arguments as to why just that might well happen. In any event this wouldn't be - as Landon Thomas pointed out in this article - the first time the Fund has gotten things badly wrong on Spain. The thing is, once you get past that troublesome first phrase, much of the report - leaving aside one or two topics I will draw attention to - seems remarkably unobjectionable. The opening paragraph continues, "Growth has resumed, labor market trends are improving, the current account is in surplus, banks are healthier, and sovereign yields are at record lows", most of which is unquestionably true. And then those positive evaluations are suitably and appropriately counterbalanced by a string negatives, "But unemployment is unacceptably high, incomes have fallen, trend productivity growth is low, and the deleveraging of high debt burdens—public and private—is weighing on growth". So actually the fund isn't at all saying that all is well in Spain, and that the level 5 alert is now all but over - far from it. Perhaps an opening phrase more in tenor with the general drift would have been "Spain's recovery continues to gain traction". As I say, most of the positive assessment offered is valid. Most, but not all. There is one exception: the state of the current account. It is no longer positive. 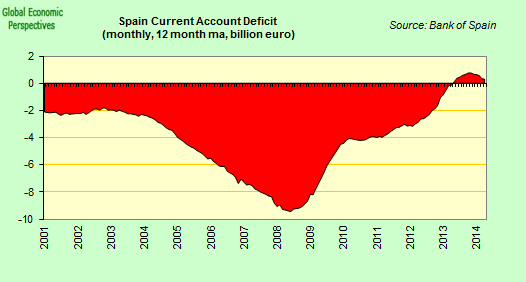 Surely it is true to say, as the authors do, that "Spain has managed a remarkable improvement in its current account". During the last 5 years the balance improved by 11 percent of GDP, moving from a deficit of 10 percent in 2007 to a 1 percent surplus in 2013. But that was then, and this is now, and as the recovery has progressed part of the improvement has been lost. During the 8 months between May and December 2013 the account was in positive territory. 8 months in something like the last 150. For each of the five months of 2014 however - just as the economy has been accelerating - it has been consistently negative. Indeed the fact this might happen was expressed as a constant concern in earlier editions of the report (namely, that as things improved the CA balance would once more turn negative). Now it has, which is perhaps one of the reasons why they were ill-advised to use that "corner turning" phrase. 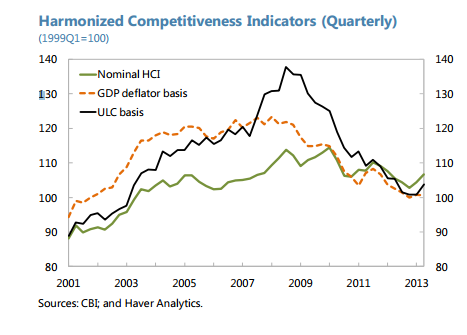 "Spain’s current account improvement is particularly notable given that it was achieved without nominal depreciation. South Korea’s adjustment was facilitated by a large nominal exchange rate depreciation, an option that was not available to Spain. While Spain’s real effective exchange rate (REER) did depreciate significantly based on unit labor costs, it largely reflected labor shedding. The CPI-based REER has not depreciated much." What the authors are getting at here is that Spain's nominal internal devaluation was very small, and indeed the overwhelming majority of Spanish experts have consistently argued that more wasn't needed since the economy hadn't lost as much competitiveness as "outsiders" claimed. On the other hand there was a large improvement in Unit Labour Costs produced by the comparatively small fall in GDP output (roughly 7%) and the very large drop in the number of those working (about 20%), but this way of doing things always left the concern that as the economy started creating jobs again the average Unit Labour Cost would start to rise again, as we have seen happen in Ireland (see chart below). In fact there is even some indication that this may already be happening. In the 12 months to March the economy grew by 0.6% while the number of those paying national insurance contributions (a reasonable proxy for employment) rose by 115,000 (or 0.7%). 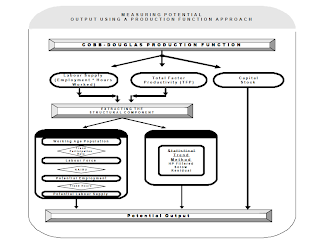 As a result the rate of productivity improvement has declined sharply. The danger thus is that many of the hard won gains of the crisis years are unwound during recovery. The current account deficit fell sharply on the back of the drop sharp drop in employment which accompanied the crisis as consumption collapsed (retail sales are still down 30% from 2007 peak) and imports followed suit. Little by little this process is now reversing, imports are once more rising as domestic consumption starts to recover and the goods trade surplus is once more deteriorating. So the correction is far from complete at this point and the risk the corner has been not been completely turned is not negligible. Which bring me to another minor quibble with this section of the report. "Exports are performing well," the authors tell us. Well perhaps the best thing that can be said about this statement is that it is a little bit out of date. 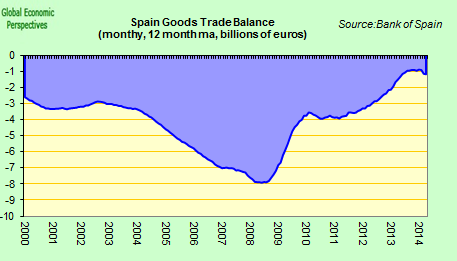 In the three months to May Spain's goods exports were up by 2.75% over the same period a year earlier. In comparison in 2013 they were up by 6.5%. Spain's export machine has been losing momentum, and - as I argue in this post -exports are now roughly stuck at the level they were at in June last year. Naturally there are reasons for this, emerging markets who were strong Spanish customers last year have had their own crisis, and now tensions in Eastern Europe surrounding Ukraine may be leading the Euro Area itself to loose momentum. But this is just it, a fragile and tenuous recovery is easily knocked off balance. The current position can perhaps be best summed up by the situation described in the chart below. Between 2010 and 2013 the economy was re-balancing nicely with external demand doing the heavy lifting while the current account moved towards balance, but over the last twelve months things have changed and external demand is now, once more, a negative drag on the economy as imports rise. This is obviously a worrying development, and naturally a cause for concern. "Model-based and historical REER analysis suggests the real effective exchange rate is some 5– 15 percent above the level consistent with medium-term fundamentals and desirable policies. However, achieving significantly lower unemployment rates closer to international peers in the medium term may require an even larger adjustment in the exchange rate". I think we are all in agreement on one thing: Spain's unemployment remains unacceptably high. But what does "unacceptable" mean? Well normally it means you don't continue to accept it and do something about it. And this is just the part I find missing from this year's IMF report. If we go back twelve months, and take a look at last years report, then it's easy to notice a clear difference: the IMF offered a proposal for doing something. Essentially the proposal, which naturally was not at all popular in Spain, was to move towards a wage cut in return for job sharing (indeed I myself agreed with this proposal - see my "Doing Nothing Is Not An Option", and even wrote a chapter arguing for it in my Spanish book on Spain). Another possibility, which I have personally advanced inside Spain, would be to temporarily change the retirement regulations to allow people to retire from 60 onwards on the condition that their employer replaces them with someone previously unemployed and under 30 (not obviously job for job) on a long term contract. Now, you will say, doesn't this roll back the 2010 pension reform which tied retirement ages to life expectancy and saw a progressive increase in retirement age from 65 to 67? This reform was much applauded at the time, and was indeed a core part of the Zapatero government's attempt to regain market credibility. My response to this objection is, indeed it would, but lets think about the situation for a moment, and in particular about the meaning of Keynes's oft over-cited phrase, "in the long run we are all dead". What Keynes is getting at here is that we need to be "nimble of thought" enough to be able to distinguish between the different time horizons involved in economic policy. (And not simply shrug our shoulders because "in the long run it will all sort itself out). Simply because something is advantageous in the long run, doesn't mean that a policy to promote it is what is needed in the shorter term. There can be a trade-off of interests, and doing something which might be harmful in the longer run (running up government debt), could be not only a palliative in the short run but could lead to a superior long run outcome if it is done wisely. The dilemma we face in Spain was summed up in more theoretical terms by the founder of modern growth theory - Robert Solow - when he admitted in his Nobel acceptance speech, that "the problem of combining long-run and short-run macroeconomics has still not been solved". In the long run, despite the fact that we will all die, we are all living longer, and having longer working lives makes sense. But in the short run, in a country with 5.9 million people unemployed (half of them for over a year) and over 50% of those between 16 and 24 who are looking for work unable to find it, asking people to work longer doesn't seem to make that much sense. Letting people retire to be replaced by people with a younger mindset makes obvious economic and productivity sense, but what about the implications of such a decision for the pensions system? Wouldn't this be moving backwards? Well this is where the second (2013) pension reform comes in. That reform introduced the principle of "sustainability" into the Spanish pension system. Sustainability means - across the economic cycle - as much money needs to come in as goes out. I think this is a good reform, indeed a vital one, since it turns Spanish pensions from being a defined benefits system (which would be unable to live up to its promise) into an easy to understand defined contributions one. The pension system becomes an implicit contract between those working and those receiving benefits and takes the government (and most importantly its finances) out of the middle. There is a formula to decide how much can be paid in any given time period, so if more people suddenly start claiming pensions naturally pensions will go down proportionately, but there is no system to collapse, and there will be no knock on effect on government finances. What both these proposals have in common is that they involve solidarity and they involve sacrifice, and neither of these seem to be very much in fashion at the moment. But people need to be aware of the longer run consequences of doing nothing. And this is just where expressions like "Spain has turned the corner" don't really help, since they don't put people in the right frame of mind. If unemployment is unacceptably high then it is an urgent matter to do something more about it, and not just sit there with our arms folded to see if the IMF forecast of unemployment moving under 20% in 2019 is fulfilled or whether it happens in 2018, or 2020. These kind of outcomes simply won't do, and as we will see below they will have long run consequences for Spain. I think virtually everybody agrees that the Spanish economy will grow this year at a rate lying somewhere between 1% and 2%. Naturally a lot of debate and energy has been invested in arguing about just which end of the range will be nearer the final mark. The end result, whatever it is, will be better than expected six months or so ago but at the same time it will hardly constitute an economic revolution. No game changer to see here, please move along. The issue is really what we can expect from Spain in the years ahead, well beyond 2014 and 2015, and in approaching that tricky question there is no piece of current economic data that can help us decide. We need a different approach: growth analysis. To put things into some sort of perspective on this account it is worth perhaps noting Spanish retail sales were up a mere 0.3% in the three months through May over the same period a year earlier, while industrial output was up around 2.5% over the same time horizon. The notable difference between these two numbers reflects the fact that at the end of the day the future of Spain's economy is now more linked to the sale of industrial products abroad than it is to the level of shop sales at home. But the second thought to take away is the sobering one that both of these indicators are still down around 30% since 2007, and that at current rates the economy will need over a decade to get them back to earlier levels, if it ever does. 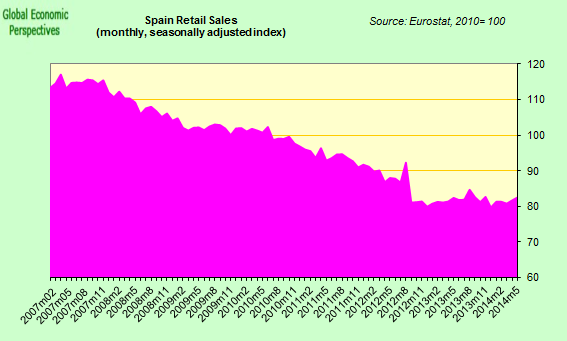 I say *if* it ever does, since a clear possibility exists we may not ever see Spanish retail sales activity in getting back to their earlier pre-crisis highs. The reasoning behind this idea is simple: after rising rapidly in the first decade of the century Spain's population is now falling and aging at quite a rapid rate, and if that rate isn't at least slowed then a decade from now (whatever the reform progress the country makes) it is hard to see the Spanish economy eking out a hell of a lot in the way of growth. Which means if we don't hit those pre-crisis levels soon, which we surely won't, we may never do so - a more thorough explanation of the justification for this (for many perhaps surprising) assertion can be found in my Secular Stagnation Part 1 - Paul Krugman's Bicycling Problem). "Longer-term potential growth prospects also appear weaker than in the boom years. 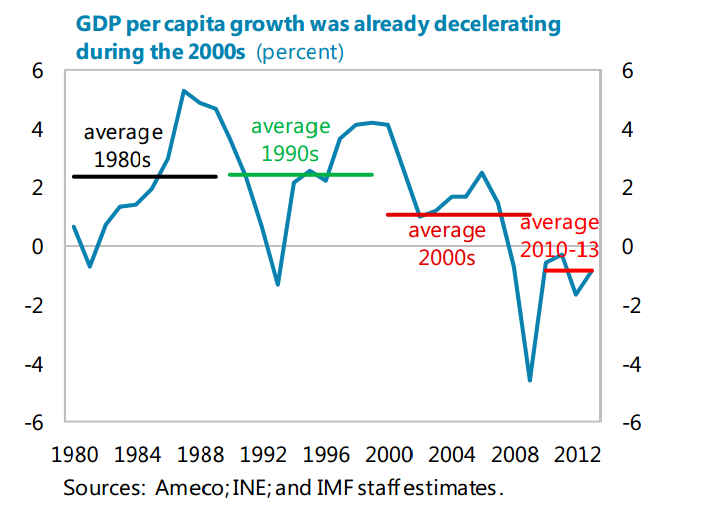 Growth during 1995–2007 was sustained by large accumulation of capital (the credit-fuelled housing boom) and labor (immigration and rising participation rates) hiding a substantial decline in productivity growth. Demographic trends have now turned negative (emigration and the ageing population) and capital accumulation will likely be lower (given the large rise during the boom and falling population). 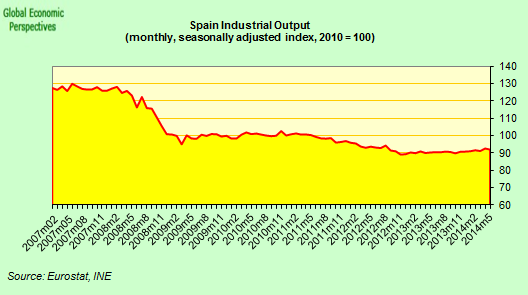 Spain will also need to tackle the negative effects of very high structural unemployment. In this context, potential growth may only be around 1 percent over the medium term." They back up the idea that Spain's longer term growth outlook (as opposed to short term recovery-from-the-slump growth) is moving steadily lower with the help of the nice chart I reproduce below. 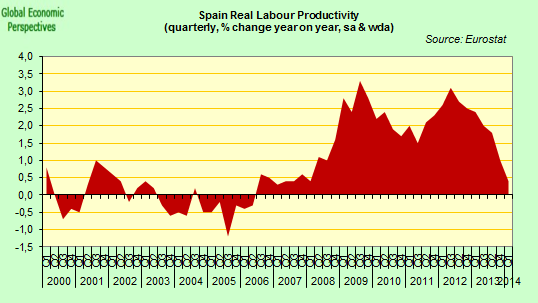 Before the mid 1990s a significant part of Spain's growth had come from productivity improvements. Even in the second half of the nineties this remained to some extent the case. But between 2000 and 2007 the red markers almost completely disappear from the chart and as can be readily seen from the chart growth was almost entirely explained by increases in the capital stock (the result of construction activity) and higher labour force growth. This is not the direction a country which wishes to raise its living standards by engaging in higher value added work wants to go. Now, in the wake of the crisis, the country faces an enormous challenge since it has to start raising average productivity at the same time as it tries to put 3 million low skilled workers back to work. We have noted above that Spain has been creating employment on much lower than expected GDP growth, this is only partly good news, since the other side of the coin is that productivity improvements (see the red markers in 2012/13) are now slowing. This is what many feared might happen (current again deficit turn negative, productivity gains weaken) and is a warning signal that the current recovery may not be on such solid ground as some imagine. But moving beyond the present, the reason we can expect this ongoing fall in trend growth rate to continue has to do with the composition of growth and how trend growth is estimated. Basically long term growth potential is a function of working age population dynamics and total factor productivity (TFP) growth, as shown in the diagram below which illustrates the version of the approach used by the EU commission. 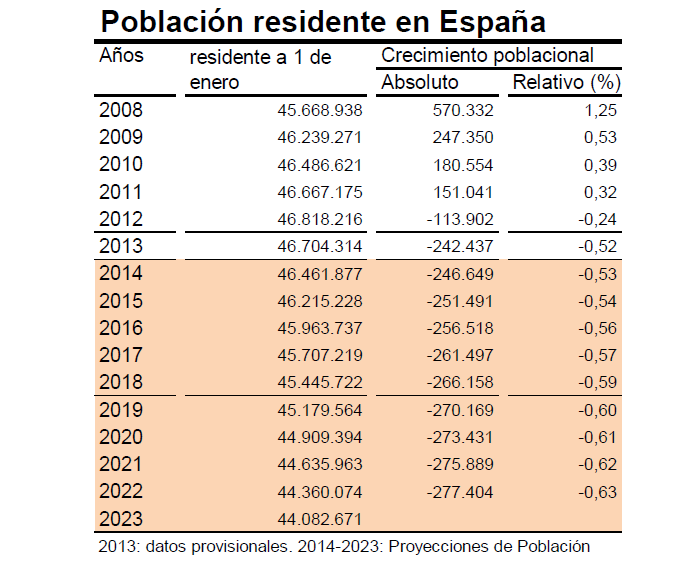 Leaving immigration and emigration aside for a moment, Spain's population is now virtually stagnant, fertility is around 1.3 (tfr) and the annual balance will soon turn negative. The annual number of births had been rising before the crisis, but has now started falling again (see chart from statistics office below). The annual balance between births and deaths also rose to a peak in the boom years only to subsequently fall back (see chart below). In fact the difference between births and deaths was a record low of 36,181 in 2013, and within a few years the balance will surely be negative. But again we need to remember, in economic growth terms it isn't the size of the population that matters, it is the age structure, and Spain's working age population will certainly shrink faster than the overall population will. So even on the best of scenarios Spain's workforce is now facing slow and steady decline and this will undoubtedly bring down the trend growth performance. "Demographics have turned negative. After expanding at a fast pace until 2007, population growth slowed significantly and turned negative in 2012. This is likely to be a new trend, as INE projects working-age population to continue to decline over the next years........Labor dynamics will make a much weaker contribution to potential output. Demographics will be a drag on growth due to declining working-age population (emigration and ageing). The Spanish statistical agency (INE) expects working-age population to fall by 1 percent a year over the medium term." During the boom years over nearly 6 million immigrants came to live or work in Spain. The population - which as we have seen is nearly stationary in terms of births minus deaths - shot up from 40 to 46 million. But now, as the IMF say, this dynamic has turned negative. 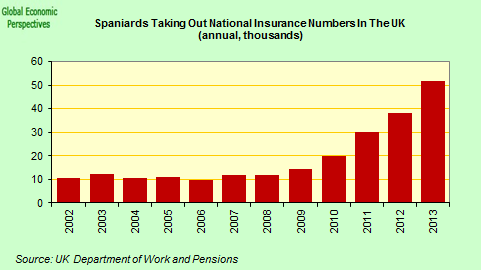 Quite how many people of working age are leaving Spain every year is hard to say. 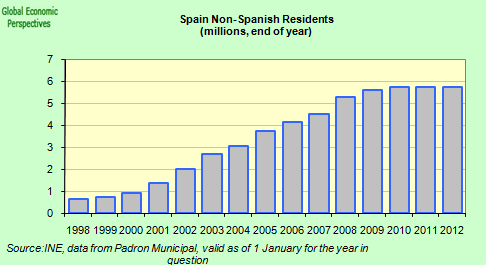 This, in part, is because while the number of former immigrants leaving is known with a reasonable degree of accuracy, the number of young Spanish nationals who do so is much harder to pin down, in part because you need to go to receiving countries like the UK and Germany to obtain the data since most Spaniards who are working abroad have not registered with the national authorities. According to the latest estimates (30 June 2014) the net number of emigrants leaving Spain in 2013 was 256,849. Of these the net number of Spanish nationals leaving was 45,913. But this latter number is confusing since during 2013 some 190,000 former immigrants obtained Spanish nationality and some of these subsequently left for other EU countries. More to the point perhaps, is that these are net numbers. 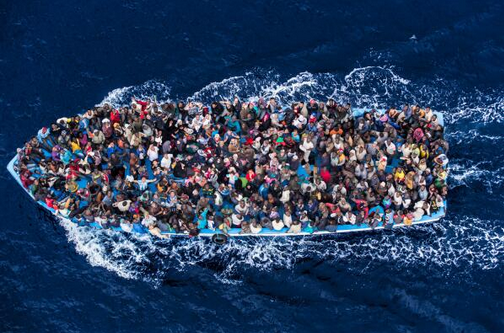 The gross numbers are even more shocking: over half a million people left Spain in 2013 (547,890 to be exact), while some 291,041 new immigrants arrived. Now I don't want to get into the issue of the enormous tragedy that is taking place daily on Europe's southern borders (and in any event many of the newcomers currently arriving in Spain are doing so as part of family regroupment processes) but the absolute number of people leaving is very large, and those leaving possess a skill set which is vastly superior to that of those arriving, so in the longer run the human capital drain on Spain is massive, again reducing the potential longer term growth rate. As the IMF point out, projections here are pretty risky, but still the Spanish statistics office (INE) have made an attempt, and the result can be seen in the table below. The impact of this hemorrhage (if it is confirmed over time) on Spain's population pyramid will look something like this. Basically Spain's population will suddenly have become much smaller and much older. The population will fall by 2.6 million, and the number of people in the 20 to 49 age group will fall by 4.7 million (or 22.7%). This is why it is so important to try to do something more and boost employment rapidly. Otherwise the impact on long term growth will be sizable, and the pressure to reduce pensions constant. This INE population and emigration forecast is, if you like, based on a no policy change assumption, on what will probably happen unless substantially more is done. It is the sense of urgency about this need to do something more that I - and others - do not find encapsulated in the phrase "Spain has turned the corner". If these population projections are realized then quite simply it won't have done so. Pensions, for one thing, will be set on a continuously downward path, which is why I think pensioners could be convinced of the need for them to make sacrifices now, if the situation were better explained to them. For another the debt which is currently accumulating will have fewer and fewer people left to pay it. 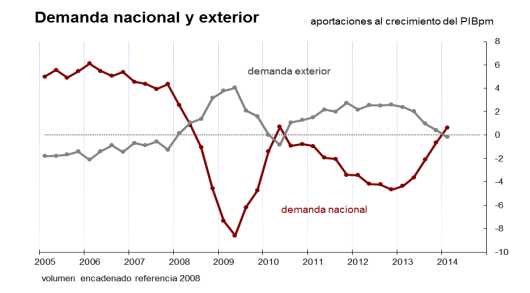 And lets not even start talking about the impact of this sharp reduction on the value of Spanish property. The real problem in Spain - and this issue isn't treated in the report - is the complete collapse of civic confidence in many of Spain's institutions, from the Bank of Spain, to market regulator CNMV (the Bankia IPO, Preference Shares), to politicians and political parties (the Barcenas affair, among many others), to the monarchy. It is this crisis of confidence which makes it so difficult to get the consensus to make more sacrifices. Many say that there can't possibly be 25% unemployment in Spain since if there were there would be a revolution (referring to the existence of the underground economy but conveniently forgetting that the worst years of the 1930s depression were not years of revolution, those came later). What people are missing about Spain is the way the credibility of the institutional structure is weakening. Voices talking about a constitutional crisis are growing. The economic crisis basically coincided with the moment when the set up established - including the return of the monarchy - during the transition from Franco's dictatorship to democracy was increasingly seen as having "run its course". Many observers recognise that major constitutional reform is needed and some kind of "rebirth" and renovation in the political system. Last months EU elections were the latest warning signal. The two main political parties (the so called institutional parties) for the first time since the transition failed to get over 50% of the popular vote between them, while the Syriza-like Podemos - who hadn't even been listed in the opinion surveys - surged from nowhere to take 5 seats and 9% of the vote. And in Catalonia a large majority of voters voted for parties who are actively campaigning for independence from Spain. A general election is coming next year, but it is hard to see either of the "old" parties getting a majority without a complex set of coalition partners. So rather than asking whether Spain has now gone round the bend perhaps the Fund would have been better off sticking with "Getting better, but not out of the woods yet, not by a long way".